Wing span: 1 11/16 - 2 5/16 inches (4.3 - 5.9 cm). Identification: Hindwing is lobed. 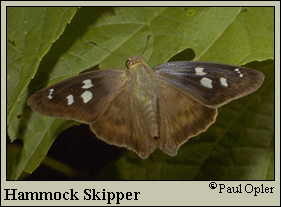 Upperside is black-brown with 3 square white spots. Underside of hindwing is brown with a blue sheen and a black spot near the base. Life history: When inactive, adults rest upside down on the underside of leaves. They are most active on sunny days, but fly mostly in the shade. Flight: Several flights from May-September in the Southwest, many flights all year in southern Florida. A rare stray from Mexico into South Texas. Caterpillar hosts: In Florida, Jamaican dogwood (Piscidia piscipula) and karum tree (Pongamia pinnata); other legumes elsewhere. Habitat: Openings and trails in hardwood hammocks in Florida, near small permanent streams in Arizona, subtropical woods in South Texas. Range: Argentina north through Central America and Mexico to the West Indies and southern Florida. Strays to Texas and the Southwest. Conservation: Hardwood hammocks in Florida should be conserved. Tveten, J. and Tveten, G.  1996. Butterflies of Houston & Southeast Texas. Univ. of Texas Press, Austin, TX. 292 pp.